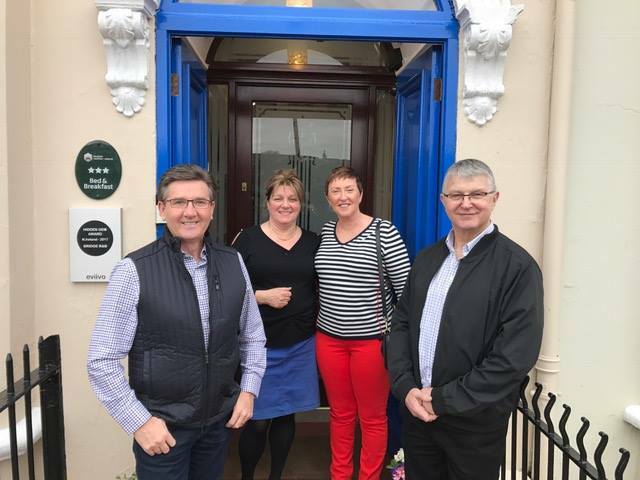 Daniel O’Donnell and his wife Majella received a ‘Legenderry’ welcome when they stopped off in Derry-Londonderry during their B&B Road Trip series as shown on RTE tonight. 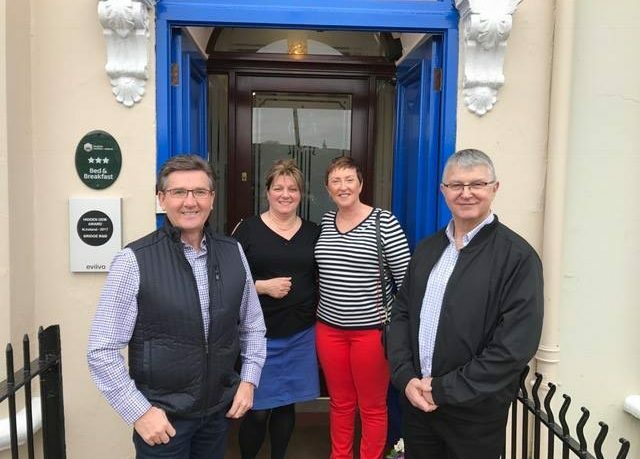 And Bridge B&B owner Ursula Walsh, who enjoyed a jive with Donegal’s most famous singing star and former Strictly Come Dancing contestant, loved every minute of hosting the fun couple. But each and every one of Ursula’s guests can expect the same first-class service, as the crew of the Liverpool 2018 Clipper Round the World Race yacht will discover when they arrive next month. With such an investment in her business, Ursula – who was one of five finalists from a field of 12,000 for Outstanding Host in a Europe-wide competition – feels it’s only fair that she returns the favour and so she is swapping her usual blue branding – which matches the Craigavon Bridge after which her establishment is named – and instead is going in the pink to tie in with her team’s colours! Boats competing in the Clipper Round the World Yacht Race are set to arrive in Derry-Londonderry from the 10th July with the Foyle Maritime Festival starting on the 14th July. This will be the fourth time the city has staged a festival full of food, water activities and showcase events, to coincide with the Clipper Race yachts’ stay. The entire riverside will be alive with around 160,000 people expected to soak up the atmosphere for the duration of the festival which runs until Sunday, July 22nd when the Clipper Race yachts will sail away to start the final stage of the 2017-18 edition of the race from Greencastle, County Donegal before finishing in Liverpool the following week. Ursula said: “Derry is such a huge deal for all the Clipper Race crews, they don’t get treated like that anywhere else with something laid on for them every day for nearly two weeks, and all their families and everyone around them too, so I wanted to make sure I put in a good effort. “It’s great for the city, great for tourism, people come from everywhere for the Clipper Round the World Yacht Race. They see it once and then they come back, they’ve found a destination. Even though they had heard of Derry before, they come for the Foyle Maritime Festival and then return. “The Clipper Race crews tell all their friends and families about the welcome they get when they come to Derry, so they all decide to meet the boats here and all these people have to have somewhere to sleep, have somewhere to eat, have somewhere to go for a drink, so it’s worthwhile for everyone. Ursula added: “I’ve offered self-catering accommodation for the last 15 years or so but I thought there was a need for more bed and breakfast accommodation so I opened up just in time for Halloween in 2016 and the business has been going from strength to strength. We were awarded the ‘Hidden Gem NI’ award within the first year of opening and I’ve been shortlisted for this year’s North West Business Awards. “I love meeting people and talking to people and my three children are involved behind the scenes as well. Liam is a hospitality technology consultant so he’s helped me apply state-of-the-art systems here such as paperless check-in and top wi-fi which both local and international visitors expect now. It means we have facilities like those in top hotels but we can offer a warm, friendly, personal touch. 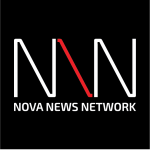 Kevin has done the website and photography which looks great and my daughter Helena takes care of the social media. We all have our different strengths which we can contribute. “Our guests come from everywhere – there are lots from the USA, Canada and Germany but also ones from China, Italy, Spain, France and Japan as well as Ireland. “We employ five local full-time staff and another two or three come in to help. It’s great for the business to be completely booked out for the Foyle Maritime Festival, any business running at full capacity is brilliant, it’s great for me and great for the staff who will earn extra wages,” added Ursula.